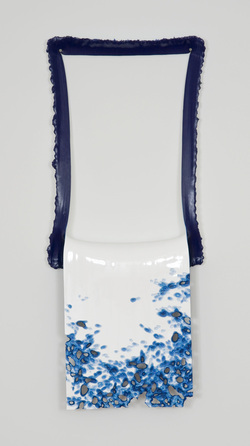 Janet Kurnatowski is pleased to present Cast, a collection of recent works by Kris Scheifele. This is Scheifele’s first solo show with the gallery. Cast is comprised of a selection of works from her Contortion series project, which explores process and the investigation of what paint can do physically. Scheifele’s objects, which she labels as Contortions, are created by the buildup of acrylic paint applied in layers on top of one another. These coated slabs are pulled up, then sliced, carved, and/or peeled, and hung on the wall. When hung, gravity takes over, which stretches, sags, and bends the Contortions into shapes that allude to time, physical presence, and the manipulation of human form. The work is raw in both its process and presentation, as it displays paint solely as paint. These pulled and pierced shapes comment on the common tradition of supports by eliminating them all together, while creating a fresh display of art as material. Kris Scheifele received her MFA from Pratt Institute, and her BA/BFA from Cornell University. Her work has been included in numerous shows, including exhibitions at LMAK projects, PS122 Gallery, 92YTribeca, Cue Art Foundation. Scheifele has received a full fellowship to attend Skowhegan and has received the Joan Mitchell Foundation MFA Grant. She currently lives and works in New York. For more information or images, please contact the gallery.